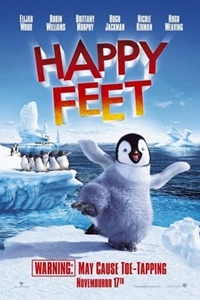 "Happy Feet" is set deep in Antarctica. Into the land of Emperor Penguins, where each needs a heart song to attract a soul mate, a penguin is born who cannot sing. Our hero Mumble, son of Memphis and Norma Jean, is the worst singer in the world. However, as it happens, he is a brilliant tap dancer! Runtime 01 hr. 48 min.